Provide comfort for the family of Teodoro Mancuso with a meaningful gesture of sympathy. Teodoro Mancuso passed away April 2nd, 2019, at Humber River Hospital after a year-long battle with cancer with his devoted wife of 49 years Maria Rosa Mancuso (Galloro) at his side. He was born in Nicastro (Lamezia Terme), Italy, May 24, 1943 to Pasquale Mancuso and Filomena Mancuso (Lio). Deeply saddened by the loss are his two sons Pasquale (Mary-Jo) and Nick (Dominga), and his mother-in-law Rosaria Galloro. To the end, Nonno Teodoro was endlessly proud of his six grandchildren Rosa, Francesco, Amadeo, Giulia, Daniel, and Ivano. Survived by his sister Concetta (Giuseppe) and blessed with many nieces and nephews, Uncle Teddy smiled at the mention of them and looked forward to the many family occasions and visits. Our deepest gratitude to the doctors, nurses, and staff at Humber River Hospital and to friends and family for all the love, support, and prayers. 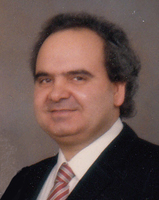 To send flowers in memory of Teodoro Mancuso, please visit our Heartfelt Sympathies Store. We encourage you to share your most beloved memories of Teodoro here, so that the family and other loved ones can always see it. You can upload cherished photographs, or share your favorite stories, and can even comment on those shared by others. Tony & Giovanna Ruberto Family sent flowers to the family of Teodoro Mancuso. Tony & Giovanna Ruberto Family purchased flowers for the family of Teodoro Mancuso.